In the Sierra Club's outing dictionary, the term exploratory refers to the fact that the leader of the trip has not scouted the route. Now, I guess one could make the argument that all of life is exploratory. You only get one shot. Nevertheless, an exploratory trip usually brings a couple of surprises, especially when you are not on well-traveled trails. I had been wanting to do this trip for several years, but have been "skunked" many times by the unusually dry late summer and early fall weather we have experienced. To camp, you really want to have water, and even on a wet year, the spring at Bob's Bald (known to some purists as Bob Stratton Bald) is pretty minimal. In dry times, it can be several hundred feel of steep descent. Better to wait for a normal year. This fall had been warm and wet, so I figured this was the time. There are many routes to Bob's Bald, a mile in the sky along the ridge crest near the state line separating Tennessee and North Carolina. The one that I had not done involves leaving from the Maple Springs overlook, and taking some new trails built by the Youth Conservation Corps in the late 1970's. By the standards of the Smokies, whose trails were built in the 30's by the CCC, anything built after I had moved to this region was pretty young. Hint: they don't build ‘em like they used to. Five of us: Susie, myself, Will, Bob, and Barbara met at the Wal-Mart outside of Maryville, and headed south on US -129, where at the junction with TN 72, we met Bob, and Teri and Pat. So 8 of us took off across the stretch of road the motorcyclists call The Dragon, with its serpentine curves (300+ I am told). An 11 mile stretch that you do not want to plan on covering in less than a half hour. As we headed south on US129, we figured it must be some sort of hunting season. There was the usual mix of fellows in fancy trucks, and just plain good ole' boys, all dressed in blaze orange. A lot of folks do not like to hike during hunting season, since they feel that they could be potential targets. 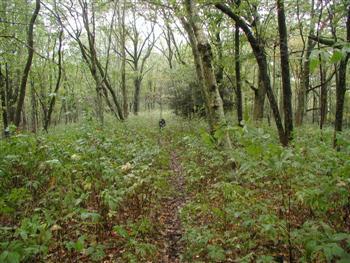 It has never worried me too much in this part of the country, as the long distance visibility in deep woods is so short that it is hard to mistake a hiker at a range close enough to see him moving. We pulled into the Haoe Lead trailhead about 9:45 am. There was an older gentlemen standing there near his truck, with his orange vest and radio. Looked like it was bear season, as you could hear baying of the hounds in the woods. Just what I look forward to when I backpack: lots of noise from canines in search of the holy grail. Maybe I was not in a very good mood, what with all the folks lining roads that are otherwise deserted, but the fellow near his truck started telling to me to watch out for the snakes in the woods, and the fact that the air was thin up hear. I told him, no, the air is thick at this elevation, and mentioned that I had been backpacking in the Beartooths in Montana at 10,000 feet. I asked him if he had ever been there, and he couldn't reckon that he had. There was an obvious trail right across from the trailhead sign, but it was not pretty: steep as hell up the side of the hill, because the only other thing that we saw seemed to be taking off in the wrong direction, and there was no trail sign. Well, this steep thing that we were on finally intersected with the real Haoe Lead trail, and we were finally underway. 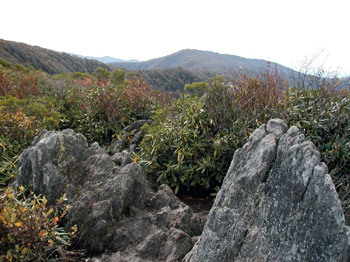 The trail climbs gently and crosses over the west side of the ridge, and begins its slab around the north face of Rock Creek Knob. Within a half hour, we came across our first pack of baying dogs, running on the trail, and then leaving it just in front of us. Probably following some lost hunter who had a bottle of bear scent on him. In a couple of minutes, a man and a young boy followed the hounds. Gee, it looked like they were having such a wonderful time. Anyway, as we slabbed around on the north side of the ridge approaching the intersection with the Deep Creek trail, I slipped on some very "greasy" rocks that the trail builders decided were simply too much trouble to move. I landed hard enough on my left knee to encourage me to sit and catch my breath for a few minutes. As we neared the intersection, we were passed by a bunch of day hikers. We knew one of them: Gene Curp from Nashville. Why it is always a good idea to be on your best behavior - you never know who you will run into. We turned west on the Deep Creek trail, which follows a long descending route to near its crossing of - what else - Deep Creek. The trail had a lot of big rocks on it, that required careful crossing. In fact, Will reported later that he had taken a pretty bad fall too. Either we were getting too old, or the trail had been poorly constructed. Don't believe the guidebooks. You lose a lot more than 200 feet of elevation heading to Deep Creek. It is more like 600 feet. But within a couple tenths of a mile of the crossing, the trail gives you a bit of what you can expect for the next couple of hours: steep climbing. We all gathered in the mixed hardwood forest just below the crossing a tad before noon. It was our first real rest break since we had started and we knew we had a lot of climbing to go. Pat showed up just a few minutes behind the rest of the crew. She was having a very hard time on the rocks, mainly because negotiating them required more flexibility than she had. We all remarked at how slow going the trail seemed to be. Either that, or the mileages were understated. Pat kept on hiking through the lunch break, so that she would not hold folks up. But she came to one of the many "uncertainties" in the trail, and waited until folks who were more sure of the route caught up. After lunch, the real fun began. Short flat stretches interspersed with steep uphills. This is when the crew started to separate. Barbara reported that she had very little after lunch go juice and encourage me to pass her. 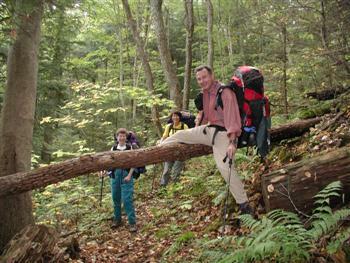 After about 50 minutes, we all stopped for a break among a small stand of hemlocks. I got out my GPS, so as to figure out exactly where we were along the trail. When I announced that "Hey, we only have another 1000 feet of climbing to Haoe left, Will later told me that it was one of the most depressing things he had ever heard. But there is no way to make the climbing if you don't start throwing one foot in front of the other. So we took off again. Since we did not have far to go to Saddle Gap, the trail could just go up. And it did. Teri and Bob seemed to be in the lead, Will and Susie not too far behind, and Ray and Barbara and Pat behind me. I had noticed that somehow that morning, I had pulled the big muscle in my right calf, and it was hurting pretty good. That muscle seems to have gotten a whole lot more susceptible to strains, pulls, etc in the past few months. Who knows what other things will start to go wrong. At any rate, by 2:45, I had made it to Saddle Gap, the low spot between Hangover and Haoe. Susie was sitting on a rock, waiting patiently. She had been there for about 10 minutes. Will and Bob reported that to the north (toward Hangover) all the flat places were filled with tents. He had counted maybe 25 people out there. The main issue right now was what to do about Pat. We knew she was moving slow, and she had confided at the last rest break that had she known how hard the trip would be, she would not have come along. I mentioned, well, the write up was pretty accurate in the newsletter and on the Sierra Club website. She confessed to not having looked at either. Anyway, even though Teri was already here, Susie decided it would make more sense for me to go on, and that she would wait for Pat, because she figured it would easily be another half hour before Pat arrived, and besides, I was the one carrying our tent. So at 3:10, Bob and Will and I took off for Bob's Bald, about 2.5 miles west of us along the ridge. With my hurting calf, the other two quickly left me in the metaphorical dust. But before long, Susie showed up. She indicated that Pat had arrived right behind Barbara, and so Teri was going to accompany her on the remainder of the route. Well, after the final short climb to Haoe, the trail starts its descent toward Naked Ground, about a 400 foot drop. There are a few big steps down along the way, and I was dealing with them carefully. The rocks all seem to have grease on them, but it was probably the high humidity that was preceding the rain that was expected to move in tonight. At Naked Ground we stopped to chat with a few folks. There was a couple there from the LA area, hiking with a fellow from Chattanooga, who said he had visited our (TwoHikers) web site. There was also a massive trail sign, that apparently, the Forest Service had put their entire yearly trail maintenance budget into building. They sure had not put it into maintaining the actual trail beds. From Naked Ground, it is 1.4 miles to the Bald. Susie confessed later to just waiting for me to say I needed to stop and take a rest break, as she was all ready to tear into me about the fact that I should have advertised this as having been a strenuous trip. But I - unknowingly - denied her that satisfaction, since I seemed to have caught a bit of a second wind on the last stretch. I certainly needed it, as my leg had deteriorated to the point that I could hardly walk on it. Ouch. I knew it was not anything serious, just frustratingly painful. Bob, who had slowed down quite a bit, claimed that he was nearing the end of his go juice. I exclaimed that if Bob is running out of gas, it must be a tough hike, because he is a really strong hiker. As we neared the Bald, Susie stopped to take a pee break, and I continued. I pulled onto the Bald at 4:45 pm, nearly 7 hours after we had started. Will had already been there a few minutes, and reported that there were hordes of people there, and that it was hard to find any places flat enough on which to set up a tent. We eventually went over to the SW corner of this multi-acre site, one of my favorites, and located some spots that were scattered, but would look like they would work. Susie arrived in a couple of minutes, and we set up our tent, pitching the more streamlined front vestibule into the breeze. We figured that when the rain did hit later that night, it would come from that direction. A few minutes after that, Barbara and Ray showed up, and asked where Teri and Pat were. It seems that they had been in front of our cleanup hikers, but Ray had never caught them, which he found strange, and they were not in camp. Now here is where we come to the issue of maps. I had sent everyone signed up for the trip a nice 1.8 MB map in the form of a gif file, with directions on how to print it on a smaller printer if you are both printer and graphically challenged. I had assumed that if people had not been able to handle it, I would have heard. Will, bless his heart, had showed me earlier in the day how he had digitally cut the map in half, printed each half on 8.5" x 11" paper (the map was designed for 11" x 17" paper) and then pasted the two together with tape. So I knew it could be done. Anyway, Teri had confessed to the fact that the map may have been attached to an email, the bulk of which she had not bothered to read, and Pat had been having problems with her email, having unintentionally closed three of the ports on her computer that deal with such. So neither of them had a map. Oh great. Now, if you have been over the stretch from Hangover to Bob's Bald a half a dozen times, it is pretty evident as to how one might proceed. But there are several trail junctions, marked by the Forest Service with signs of varying levels of efficacy. Well, we figured, it was less now than an hour to sunset, and it was not clear where they were or where to look for them. They could be anywhere withing 3 miles or so. 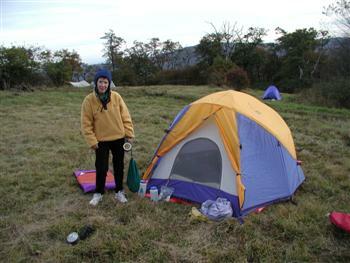 They were self contained, and should be able to make it through the night, both being fairly experienced backpackers. Not much else to do but to go get water, clean up, and try to cook dinner before it got too dark. The spring was flowing pretty well. In fact, as good as I have ever seen it. No pipe, mind you, but enough water that I could actually semi-bathe. At the spring, we talked to a fellow who had driven all the way from New Orleans to hike here. I said, isn't there any place else closer, and he said, well, just think about it for awhile. Whew. He also said that he had been just recently to the TwoHikers.org web site. Wow, that made two in one day. Anyway, we filled up two water bags, not wanting to have to visit the spring tomorrow, because there was no water until the last 2 miles or so on the hike out. Back in camp, with a home made dinner left from our "restructured" Beartooths trip, we cooked under our tarps (Will had a new one that was more like a low trail shelter) and chatted. About 6:30 pm, who should show up, but Pat and Teri. Seems like they had taken the very first possible wrong turn, and had headed down the Hangover lead trail. It loses a huge amount of elevation, that they, of course, had to regain. When Pat had mentioned to Teri that she was not sure that the turn they were making was the right one, Teri had said, "Hey, just trust me." Famous last words. As they proceeded to lose elevation (descending unknowingly toward Big Fat Gap), Teri started getting the sense that things did not "feel right." (I call such intuitive navigation, and I have, unfortunately, felt it more than once.) So they turned around, and then ran into a hunter who confirmed their mistake. So they eventually figured things out, and Pat was surprisingly good natured, although she was talking about going out a different way in the morning, and having Teri pick her up. Will kept talking about the Weather Channel having forecasted the start of rain in Tellico Plains about 9 pm, and so we speculated on how close such a prediction would be as we huddled under his tarp. Since we could still see the moon at 9 pm thru some high, think clouds, we figured the rain was a bit delayed. We eventually joined a young couple at their fire, and chatted until nearly 10 pm. Outrageously late to go to bed on a backpacking trip. The rain came in like a sand blaster about 1 am. It came in waves, and so there were opportunities to go out and relieve oneself. No need to have to use a plastic bag or cooking pot. Susie had wisely figured on cooking in the vestibule, and we did so once it got light. As we were finishing up breakfast, Bob came over and said that he was packed up, and ready to roll, so he could get home a bit earlier. We wished him luck, as it would probably be another hour or so before the rest of us were packed up and moving. It was an extremely foggy morning. 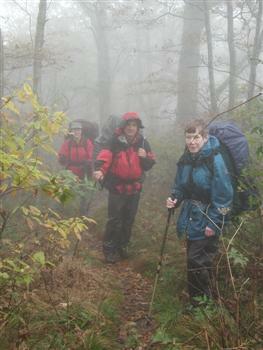 Visibility was probably less than 50 meters. By this time, we had convinced Pat that she was probably doing the right thing by going out a different way. We expected more tough terrain on the trail, and figured that everyone would wanting to be moving quickly if it was still raining. We loaned her our overview map, and figured that she could pretty easily make it out the 2.5 miles to the Cherahala Skyway in a couple of hours. I even described the trail junction at Cold Spring Gap so she would not make a wrong turn. 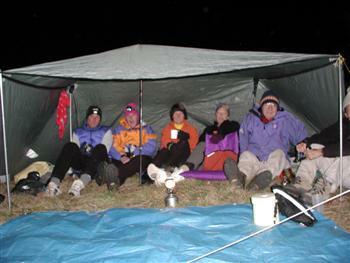 We had lucked out taking down the tent, as the rain, more like wind driven heavy mist, stopped for a bit. Of course, the tarp that I had insisted that we leave up over night, against Susie's better judgement, was totally soaked, but she graciously agreed to carry it. Our route back took us all the way along the ridge to Haoe, traversing some of the same terrain we had covered yesterday. As soon as I started hiking, it was clear that the 4 Ibuprofen that I had taken earlier was not going to touch my calf muscle pain, and it looked like it would be a limpy day. So naturally, I was in the rear. Again. It had been cold when we started, but with the rain stopping, and the climb to Haoe guaranteed to warm me up, we stopped at Naked ground to change clothes. We saddled up, and started the climb after only a short rest break. 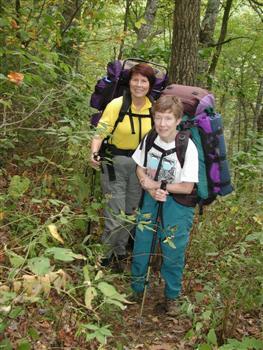 We had noted that, for a fall color backpack, there certainly had not been a lot of color. Some years I had been here in mid-October and there were hardly any leaves left at the higher elevations, let along color. This had been a warm wet fall, and things were running behind schedule. When we got to the summit of Haoe, we turned down the Haoe Lead trail. I had been on the stretch from here to Jenkins Meadow, and knew that it was a steep descent. But eventually, the descent moderates, and you can move pretty quickly through the woods on the ridge crest. Oh sure, there are some ups as well. I commented to Susie that the Youth Conservation Corps' skills at trail layout were clearly very limited. She told me to shush, and reminded me that this was MY trip. Of course, the lack of maintenance, as evidenced by the blowdowns and vegetation all along the trail, made me love the Forest Service even more. The weather was improving, and there were even a few breaks in the clouds. But really no view spots to enjoy. At least the rain must have chased the hunters back home. No baying hounds in the woods. We had just reached the junction with the Jenkins Meadow trail, and almost caught up to Ray and Barbara ( our lunch break having put us further behind) and Bob caught up to us. Bob, what was HE doing here? Didn't he leave an hour before we had? Well, yes he had. But there had been a couple of guys standing in front of the sign at the first junction he came to (the Stratton Bald Trail on the south flank of the Memorial Forest) and he effectively turned when he should not have. And he even had a map. Anyway, while he would not confess to it, judging from how far he had gotten behind, we think he made it all the way to Wolf Laurel before he realized his mistake. He zoomed off in the distance, making short work of the trail that was trying my patience. The Haoe Lead trail goes below the ridge crest for a ways, before regaining the crest. There are a few ups on this generally downhill trail. They were really annoying my right calf, but there wasn't much I could do about it. Eventually, the trail starts winding down to its junction with the Deep Creek trail. It seems to take forever to get to it, however. We did take a break at the junction, knowing that we had only a little over a mile to go. And, so serious slippery rocks. Wow, if I thought they were bad yesterday, they were awful today. We gingerly crossed them, and I was ever thankful for the walking stick that Susie had gotten for me a couple of Christmases ago. We got to the spot where we had joined the trail yesterday. We opted to take the official route, which is not very direct back to the parking area at all. 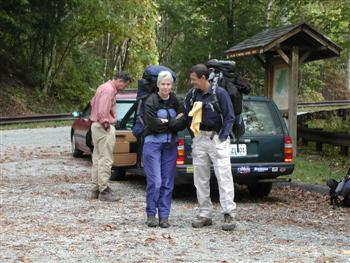 Eventually, we just hopped the guard rail and got out on to the road, to find Will, Barbara, and Ray waiting for us. It is always a good idea to wait until everyone is off the mountain. In addition, when Teri had gotten back to the car, her battery was dead, and so Will had to jump it. He wanted to make sure that we could start our car. We could and so they took off. Well, it had been an interesting weekend and a tougher than expected trip. Later in the week, Bob reported he was still sore, Will said it was one of the toughest trips he had been on - especially for an on-trail backpack, and it took me a week to recuperate from my pulled calf muscle. Susie and Ray, hey, no problem.